Travel season is about to start and seeing as many corners of the world as I can is definitely on my bucket list. Whether you're traveling for work or for fun, there are some things that you've got to bring along with you! Promote a calming effect during your flight(s), perfect for those with a fear of flying! We are now carrying the a variety of Aqua Oleum Essential Oil and Aromatherapy Associates’ travel size shower and bath oils from the U.K.! They’re the perfect size for carry-on luggage or to keep in your purse! According to Canadian Cancer Society, the sunlight in Canada is strong enough to cause skin cancer and premature aging of the skin. Although no sunscreen can block all of the sun’s rays, it’s a must to wear sunscreen with SPF 30 or above every single day, rain or shine, as an effective sun protection measure. SPF 15 sunscreen blocks 93% of UVB rays and it will erode within an hour, while SPF 30 and higher sunscreen blocks 97% of UVB rays. Remember to re-apply your sunscreen every 2 hours if you plan to stay outside! We recommend ELTA MD Sunscreen which is a zinc-based, broad-spectrum sunscreen. Zinc oxide is a natural mineral that is safe even on the most sensitive skin, including post-procedure skin and even that of children 6 months or older. Zinc oxide blocks UVB (burning) and UVA (aging) rays that have been linked to photo aging and skin cancer. Moreover, all ELTA MD Sunscreens do not contain oxybenzone or avobenzone. 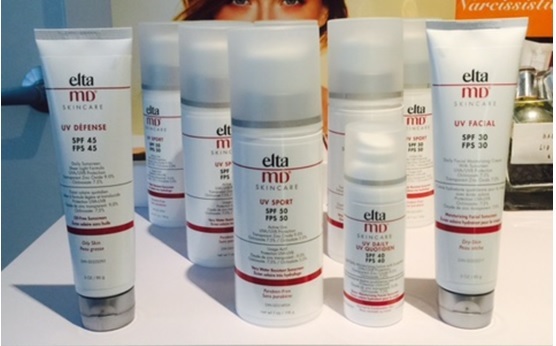 We carry a wide range of ELTA MD Sunscreen for face & body in our spa. Come in and have a look today! Why Eye Cream is Essential?